SAN FRANCISCO -- Power lines owned by San Francisco-based Pacific Gas & Electric Co. are to blame for a dozen wildfires in Northern California's wine country last fall, the state's Department of Forestry and Fire Protection said Friday. Two of the 12 fires killed 15 people. Investigators determined the fires - part of a series that were the deadliest in California history - were caused by PG&E-owned equipment. All of the blazes that raged through California last October killed 44 people, destroyed 8,800 structures and forced more than 100,000 people to evacuate. About 11,000 firefighters from 17 states and Australia helped battle the blazes. In eight of the 12 fires included in Friday's report, Cal Fire said there was evidence of violations of state law and that its findings have been forwarded to county prosecutors. The investigation into the cause of the Tubbs Fire, in which 22 people were killed in Napa and Sonoma counties, has not yet been completed, Cal Fire Deputy Chief Scott A. McLean said, CBS San Francisco reports. He said Cal Fire's report "puts the blame where it belongs - squarely on PG&E, confirming it was responsible for many of the fires that devastated so many lives." PG&E said in a statement that the company believes its "overall programs met our state's high standards" for maintaining electrical equipment and pruning about 1.4 million trees a year. 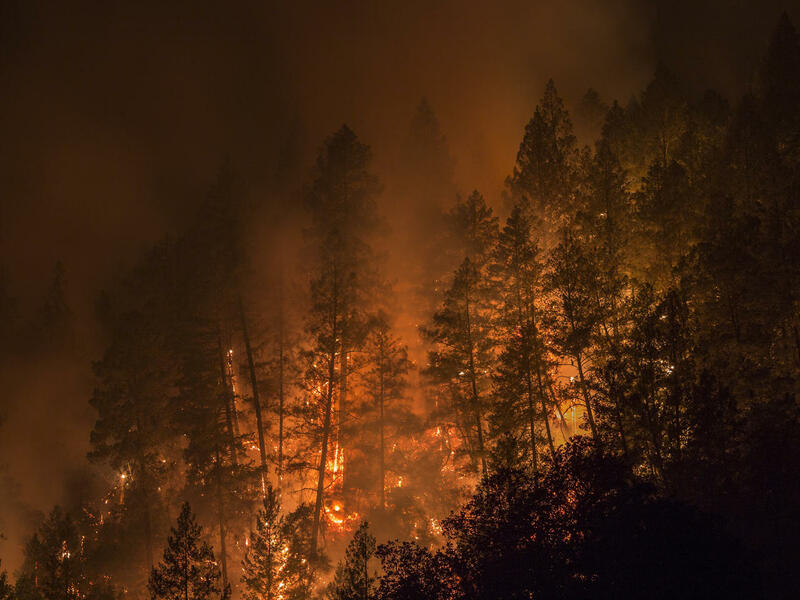 But because of California's much longer wildfire season and extreme weather, PG&E said it has made changes including creating a wildfire operations center to monitor extreme weather and fire threats in real time, putting in place a network of weather stations throughout high-risk fire areas and boosting vegetation management. In March, the company announced it would start switching off power to minimize sparks in vulnerable areas during times of extreme fire danger. PG&E and some other state utilities previously have resisted such a measure, arguing that cutting off power carries its own risks, including to patients dependent on electrical equipment. In one fire in Mendocino County last fall, investigators said Potter Valley experienced wind speeds up to 67 mph, causing many tree branches to fall, triggering numerous 911 calls reporting fires, according to Cal Fire's report. "An arc from a conductor was witnessed along with the start of a vegetation fire," the report said. A second fire also was "from an overhead conductor." The two sparked a third, merged, and burned 10 miles (16 kilometers), the report said. A responding firefighter said the smoke was blowing sideways and he had to veer around numerous tree branches in the road to get to the fire area. One homeowner told the firefighter "he saw a tree illuminate when the conductors arced." Another property owner told Fire Captain Specialist Eric Bettger that "he saw a flash to the east and saw the conductors come down. "He said the fire crossed the road within seconds," Bettger said. CalFire did not post details of its investigation into Napa County fire. Dodd has introduced legislation that would require electric utilities to update wildfire plans to determine when they need to cut power to lines during harsh weather and boost infrastructure. Nearly $1.5 billion was spent fighting fires and on recovery north of San Francisco in October, including debris removal and infrastructure repair and the destruction prompted $10 billion in insurance claims.